President Trump's message to his feuding inner circle during a Thursday summit at Mar-a-Lago was blunt, according to a source with direct knowledge: "You guys are close. Knock it off. Work together." The extraordinary presidential intervention, amid war planning on Syria, was aimed at resetting a West Wing consumed with palace intrigue as Trump closes in on his administration's 100-day mark. Ignition: The stealth combat had come to a head midweek, when chief strategist Steve Bannon's departure from the National Security Council was revealed. Bannon was fed up with the incoming he was taking — and so were his allies, inside and outside the White House. Bannon had sparred with economic adviser Gary Cohn (or, as Bannon's allies call him, "Globalist Gary"), and suspected the economic adviser was trying to undermine nationalists in the West Wing. 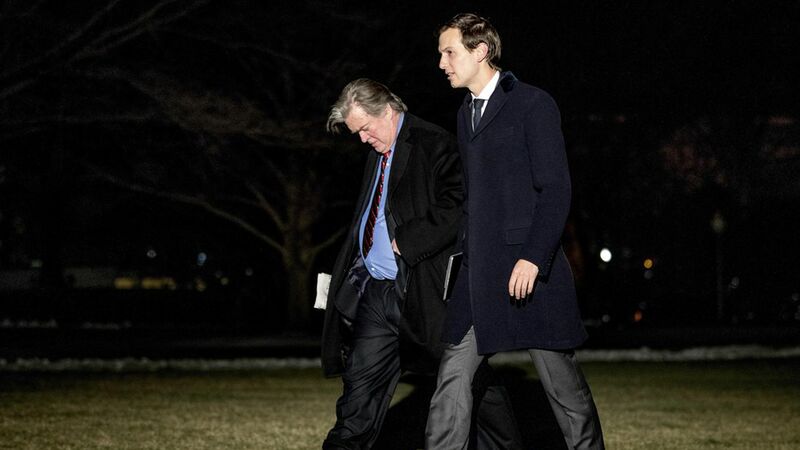 A flurry of high-level leaks about Bannon supposedly threatening to resign — something he said he wasn't contemplating — convinced his allies that Jared Kushner, the president's adviser and son-in-law, had also turned on him. One of Bannon's closest allies commiserated: "Do you know what happened with Jared? Him and Steve had such a close relationship." Escalation: By Thursday, allies said Bannon had gone full honey badger — embracing the newsroom motto of Breitbart, which he once headed: "Honey badger don't give a sh**." Bannon told associates: "I love a gunfight." Settlement: The situation had become unsustainable, and the president stepped in with the instruction to "knock it off." On Friday, there was a meeting among Priebus, Bannon, Kushner, and his wife, Ivanka Trump. The meeting was "100 percent" focused on moving the president's agenda, said one source. But the subtext was clear: The boss wanted them to make up and disarm. Although he had been considering changes on his top staff (and names of possible replacements had circulated among senior aides), they were being given the chance to fix it themselves. Bannon had fought internally against the Syrian intervention — one of the most momentous decisions of Trump's young presidency — and lost. On Saturday, his camp said new domestic policies are coming that reflect his worldview. But Kushner allies insist a new, less combative, more centrist Trump will still emerge.